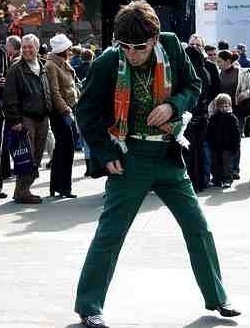 I don't know a lot about the saints, but I know what I like, and for me St. Patrick is a favourite. Born in the 4th century, he was kidnapped by the Irish at 16. God appeared to him in a dream and told him to flee captivity and head for the coast where he'd find a ship that would take him back to England – and that's exactly what happened. Later in his life he returned to Ireland, but this time on a mission: to Christianise the Irish heathens. It's said that he used the shamrock to describe the holy trinity to the pagans. There's nothing about snakes, that's an urban myth, but the shamrock stuff is inventive. After his death is when things started to really pick up, he became a saint, and then the saint with one of the most popular feast days around. Every 17th of March it's now not only the Irish and those of Irish decent who celebrate him: he's gone global. 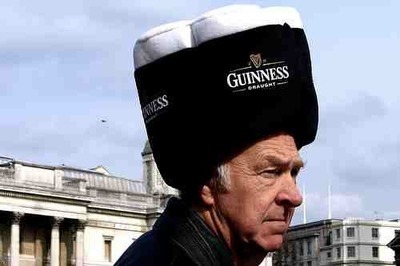 In fact one year Guinness used a slogan that read: "On March 17th Everyone's Irish". By that they mean everyone who enjoys a good parade, some singing and dancing, wearing green, having a bit of a drink (Guinness, Jamesons or Baileys are probably most traditional) and enjoying the craic. And there are lots of folks who like an excuse to do one or all of the above. 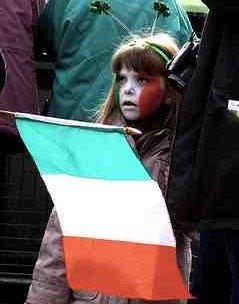 Obviously the best place to get into the St. Patrick's Day spirit is Ireland. But if you can't make it there's plenty going on closer to home as well. In London there's a parade, usually followed by revelry in Trafalgar Square. To make it easier for families to attend, this year it's being held on the 13th of March. There promises to be marching bands, celtic singing and dancing and floats - all coming down Piccadilly. 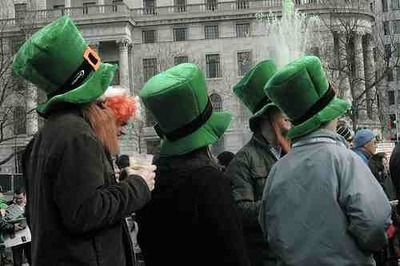 On St. Pat's Day itself the party in Trafalgar Square will be a much more adult affair. Other more formally organised events are planned by the Irish Cultural Centre, who're having a jig gig, with celtic band Beoga and le Cheile, known for their fiddling and tooting. The Centre is in Hammersmith and tickets are £18. For slightly less formal celebrations the best places to turn are the capital's big Irish pubs. Waxy O'Connors starts early – which is traditionally the way with St. Patrick's Day. They're providing the ceoil, free giveaways and entertainment, the drinks and fare, and the like-minded revellers. Oh, and plenty of green. O'Neills might not be your normal choice of pub for a night out, but they take St. Patrick's Day craic very seriously, again providing all the merry essentials. Known as one of the best Irish pub's in town, there's certain to be something planned at the Tir Na nOg in Wandsworth and Spitalfield's Water Poet do a craicing special menu and have an Irish band from 7:30. Other pubs with St Patrick's Day plans include The Tipperary, which is London's oldest Irish pub and the first place to sell Guinness outside of Ireland, The Claddagh Ring, The Porterhouse, The Quays, in Docklands, The Corrib Rest, and the in Haverstock Hill, which has had some famously rowdy St. Patrick's Days in the past. London isn't the only British city with a St. Pat's Parade, Birmingham claims to have the world's third largest, after Dublin and New York, Liverpool also has a big one and Manchester has a two week festival. Why? He's the patron Saint of craic!